From left to right: A Vladimir Kagan Barrel Chair, FreeForm Curved Sofa, Sculpted Coffee Table, and Ondine Chair in Holly Hunt's London showroom. Designed in 1952, the Floating Curved Sofa takes a reductive approach, removing all excess material so that only the essential elements of the structure remain. The hand-oiled sculptured legs guide the eye along the sofa's positive and negative spaces, creating a comfortable place to gather that won't weigh down even the most austere interiors. 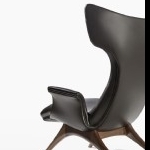 The organic curves synonymous with the work of Vladimir Kagan are exemplified by this early design. 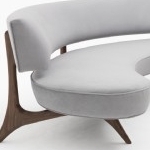 From this initial exploration of soft sensuous shapes, the signature look of Kagan designs were developed. Solid sculptured American Walnut with a hand rubbed oil finish, designed in 1950. Vladimir Kagan set the trend for a new approach to home furnishing with the introducion of the Serpentine and FreeForm Curved sofas in 1950. The sofa's free flowing curves resisted the rigidity of being placed along a wall, liberating seating and allowing for an entirely new exploration of interior landscapes. Ideal for today’s open plan spaces, the FreeForm is available in the standard size or can be made to your custom specifications. Flowing lines of polished chrome and lush leather curve together to create an exceptional chair as sculptural as it is comfortable. Impeccably balanced and undeniably sleek. 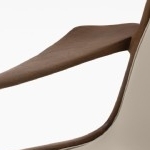 With its sensational arching curves, the Ondine Chair adds drama to any space. 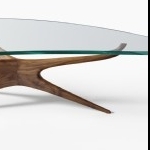 Available on an American Walnut base, the Ondine strikes an ideal balance between streamlined modernism and organic contours. An iconic Vladimir Kagan design, this chair features a body-hugging seat cradled in a sculptured American Walnut frame with a hand rubbed oil finish. Effortlessly sophisticated. The functionality and comfort you need from a dining chair infused with a Kagan flair. 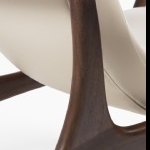 A supportive sling seat floats in a sculpted American Walnut frame. 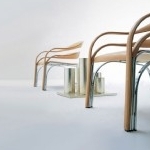 Impeccable joinery and subtle organic flourishes elevate these chairs from standard to sophisticated. 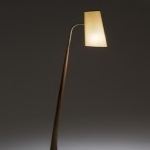 Smooth, hand-oiled American Walnut grows into a polished brass neck with a signature Kagan shade. The Cygnet Lamp exudes mid-century charm and is sure to bring warmth to any space. 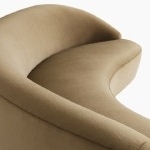 Flowing lines curve together to create an exceptional lounge chair as sculptural as it is comfortable. 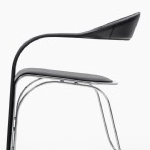 Available in leather with a polished chrome frame.